Net Weight: Packet (75 seeds)5lb (6000 seeds) (+$33)50lbs (60000 seeds) (+$304) This item is currently out of stock! A Southern favorite with excellent flavor and outstanding ability to withstand heat and drought. Bush plants which produce short 3 foot runners that do not need support. 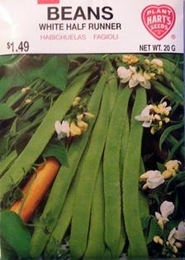 Tender and flavorful when young the pods are used fresh or frozen. White beans inside can also be dried for baking or soups. For best crop, keep free of weeds. Do not hoe when wet. For highest quality, pick pods when young, about 4 inches long. For continuous crop, make successive plantings every 2-3 weeks till mid-summer. Thinning - When plants are 3 to 4 inches tall, thin to 4- 6 inches apart.